PARIS (AP) — French President Emmanuel Macron is taking on Facebook CEO Mark Zuckerberg and other internet giants at a Paris meeting to discuss tax and data protection and how they could use their global influence for the public good. Macron on Wednesday welcomed Zuckerberg and the leaders of dozens of other tech companies, including Microsoft, Uber, and IBM, at a conference named "Tech for Good" meant to address things like workers' rights, data privacy and tech literacy. The meeting comes as Facebook, Google and other online giants are increasingly seen by the public as predators that abuse personal data, avoid taxes and stifle competition. "There is no free lunch!" Macron joked to express his expectations of "frank and direct" discussions. He said tech giants could not just be "free riding" without taking into account the common good. He called on them to help improve "social situations, inequalities, climate change." Zuckerberg came to Paris after facing tough questions Tuesday from European Union lawmakers in Brussels, where he apologized for the way the social network has been used to produce fake news and interfere in elections. But the Facebook founder also frustrated the lawmakers as the testimony's setup allowed him to respond to a list of questions as he sought fit. Macron sees himself as uniquely placed to both understand and influence the tech world. France's youngest president, Macron has championed startups and aggressively wooed technology investors. But Macron is also one of Europe's most vocal critics of tax schemes used by companies like Facebook that deprive governments of billions of euros a year in potential revenue. And Macron has defended an aggressive new European data protection law that comes into effect this week. The so-called GDPR regulation will give Europeans more control over what companies can do with what they post, search and click. Several companies took advantage of the meeting to announce new initiatives. Microsoft said it would extend the EU principles to its clients worldwide. Google committed $100 million over the next five years to support nonprofit projects, like training in digital technologies. Uber said it will finance insurance to better protect its European drivers in case of accidents at work, serious illness, hospitalization and maternity leave. And IBM announced the creation of 1,400 new jobs by 2020 in France. Aides to Macron acknowledged companies like Facebook have become more influential than governments. 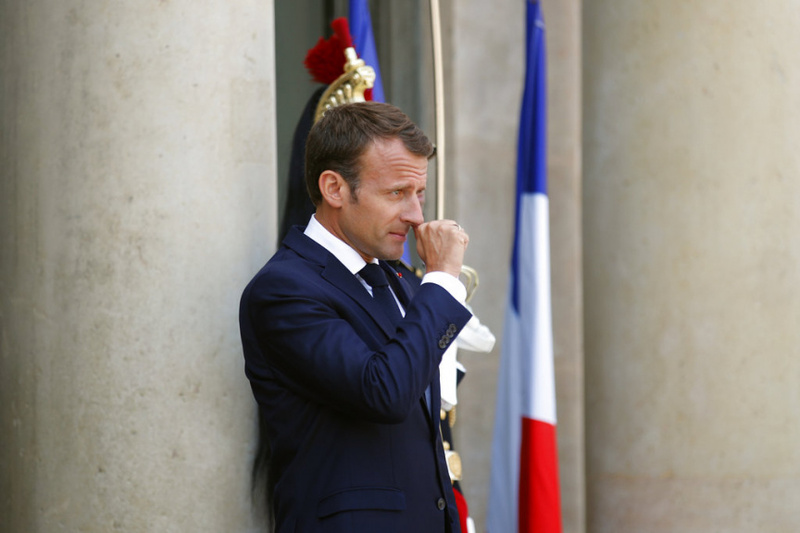 The aides insisted that Macron isn't trying to kiss up to such companies or let them whitewash their reputations through philanthropic gifts. The aides spoke only on condition of anonymity as they were not authorized to be publicly named. Privacy and taxes are among issues Macron was raising with Zuckerberg and the other tech executives in one-on-one meetings and a mass lunch Wednesday in the presidential palace with philanthropists and politicians. Macron, Zuckerberg and others are then expected to attend the Vivatech gadget show in Paris on Thursday. At Tuesday's hearing in the European Parliament in Brussels, Zuckerberg said Facebook "didn't take a broad enough view of our responsibilities," adding: "That was a mistake, and I'm sorry for it." But lawmakers left frustrated. Liberal leader Guy Verhofstadt asked whether Zuckerberg wanted to be remembered as "a genius who created a digital monster that is destroying our democracies and our societies."